The American League saw so many big moves made over the winter that it's harder than ever to determine with any confidence how things may take shape. If every team had full health all around, there would likely be extreme parity in the AL with lots of teams finishing with win totals in the mid-80s. Out of 15 teams, I count only 3 that are good bets to be really bad: Twins, Astros, Rangers. Every other AL team expects to fight for a playoff spot. Every one of them is also constructed with obvious flaws or severely lopsided rosters. These division standings could end up being jumbled into any combination imaginable and we oughtn't be surprised. The Rays and Yankees are most likely going to have down years, but both have enough talent on hand to conceivably compete, while the other three all have playoff aspirations. With their best pitcher, Marcus Stroman, now out for the year with a torn ACL, I can't say that I've got a ton of confidence in this pick. But the addition of catcher Russell Martin alone makes the Jays a much better team and they were in the playoff race pretty much all of last season, only a terrible month of August (9-17 and outscored 132 to 86) knocked them out. Adding third baseman Josh Donaldson, one of the game's best all-around players the past two seasons (14.1 total fWAR, behind only Mike Trout and Andrew McCutchen) to an already powerful lineup certainly helps too. Just like the Red Sox, the Jays are expected to have one of the highest-scoring offenses in the game, but the pitching, which features two late-career vets and three youngsters, has lots of question marks. Can R.A. Dickey harness his knuckleball well enough to pitch more like an above average starter than an amusing sideshow? Will 24-year-old Drew Hutchinson build on his solid first full season in 2014? Can the kids (Daniel Norris and Aaron Sanchez, both 22) handle a full season of pitching for a contending big league team? It's a top-heavy roster and the bottom has enough youth for some breakout potential so there's plenty of reason for optimism. With the Royals ending their playoff drought last year, the longest streak of missing the postseason now belongs to the Blue Jays. I don't think that streak will carry much further. Mookie Betts. 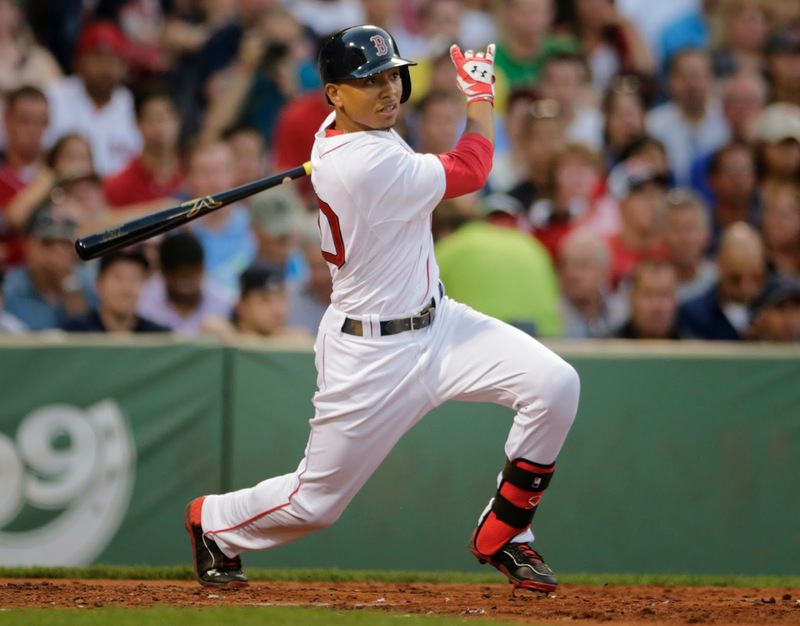 The Red Sox have a budding young superstar named Mookie Betts. He is delightful. Mookie is listed at just 5'9 and 180 lbs but, at age 22, has not yet been overmatched at any professional level. Last year he was promoted to Double-A ball for the first time, he hit .355. Then he went up to Triple-A and hit .335. The Red Sox brought him up to the major leagues and he proceeded to hit .291/.368/.444 (AVG/OBP/SLG) in 52 games. A versatile defensive player (he was a middle infielder in the minors but is the team's starting center fielder this year) and mature hitter at just 22 years old, Betts is an absolute gem and representative of the embarrassment of riches the Red Sox possess right now. They have another 5-foot-8 bopper, Cuban outfielder Rusney Castillo, who crushed the ball in limited action last year and had a fantastic spring training but who's stuck in the minors to start the year since there's no room for him on the major league roster right now. Don't forget about the other 5'8 line drive machine, Dustin "Laser Show" Pedroia, still one of the best all-around second basemen in the game though a wrist injury sapped his powers last year. I haven't even mentioned Big Papi, or the Boston return of Hanley Ramirez, or new third base upgrade Pablo Sandoval. On the offensive side, the Red Sox are as stacked as any organization we've seen in recent years. There is no doubt they can withstand injuries and flukey off-years from key players should they occur. The problem is their pitching. They'll have a relatively low bar to clear since the offense ought to average upwards of 5 runs per game, but there's no ace on this staff and there isn't even really a viable #2 starter. It's a rotation full of low-end starters who keep the ball on the ground. With more hitters than they know what to do with, the Sox will probably trade for an ace eventually, but until then expect lots of back-and-forth, high-scoring games. After alternating between 93, 85, and 96 wins the last three years, perhaps the Orioles are veering toward an every other year success cycle just like the other orange-and-black uniformed team over in the NL. With the division rival Red Sox and Blue Jays bulking up, this could be a down year for the O's. They lost both Nelson Cruz and Nick Markakis in free agency and didn't make any significant pickups. On the other hand, they were one of the best teams in baseball last year despite being without their starting catcher Matt Wieters, dealing with myriad other injuries to key players, and getting a terrible performance from first baseman Chris Davis (.704 OPS following a 1.004 breakout in 2013). They can expect to get Wieters back sometime soon and Davis has nowhere to go but up. This is also an organization that has consistently exceeded expectations the last few years with their manager Buck Showalter displaying an aptitude for platooning and generally extracting substantial production out of the roster he's given, no matter how bereft of stars. You can't count out the O's but I do think this is a year they'll be looking up at some of their rivals in the standings. This 87-win PECOTA projection is a little extreme, mostly due to very optimistic individual projections for outfielders Steven Souza and Kevin Kiermaier who Prospectus expects to amass upwards of 3 WAR apiece. As much as I would love to see that happen (I've always had a soft spot for the Rays, they're a fun team to root for), it is unlikely. Combined, the two hitters haven't reached 500 at-bats in the majors yet and I imagine the more they'll play, the more pitchers will learn to exploit their weaknesses. The other projection systems out there aren't nearly as high on those two guys. If either or both do somehow manage to play like All Stars then the Rays could contend for a Wild Card spot, if not the division title. Despite the team losing its manager, team president, and unloading some significant players (Ben Zobrist, Matt Joyce, Yunel Escobar, Wil Myers) over the winter, they still have plenty of pitching. Their all-under-30 rotation is likely the best in the division (though they're starting the season off with injury issues) and strong bullpens have long been a hallmark of the Rays. The problem they've struggled with for years now is offense and once again it's not looking good beyond Evan Longoria. Desmond Jennings is a solid all-around player but hasn't developed into the kind of hitter he was expected to be and there isn't really anyone else in this lineup to be excited about. Except perhaps the unproven Souza and Kiermaier. I don't think it's too extreme to state that the Rays will sink or swim depending on the performance of those two. Let me start by saying something nice about this team: they'll likely have an excellent bullpen. They lost their closer David Robertson to free agency (how weird does that sound for the Yanks? ), but solid pickups like Andrew Miller, David Carpenter, Justin Wilson and Andrew Bailey to go along with Dellin Betances make this a deep pen. Beyond that, there's little to be optimistic about with this team. The lineup has some firepower, but only one player is under 30 (Derek Jeter's replacement with the gorgeous name, Didi Gregorius), the rest are all in the midst of clearly defined declines. Carlos Beltran and Mark Teixeira are near locks to spend some time on the DL, Brian McCann seems to have fallen off a cliff, and while I'm hoping A-Rod plays great just to piss everybody off, he's about to turn 40 and took a year off, who knows what he's got left in the tank. The rotation has some youth for once, headed by Michael Pineda and Masahiro Tanaka (both 26) but the latter is considered a ticking time bomb because of a frayed elbow ligament and the former has continually frustrated those tantalized by his elite stuff by getting injured all the time. Maybe new pickup Nathan Eovaldi turns into a nice pitcher, but I doubt it. It's amazing to consider that the Yankees aren't purposely tanking and yet they might still finish in last place. It's hard not to buy into one of the preseason's popular breakout picks. Heck, I was intrigued by them at the end of last season and wrote them up as a team to look out for in 2015. The rotation is loaded with young talent, headed by reigning Cy Young winner Corey Kluber, the lineup is well-rounded with youth, speed, power, OBP and depth, and the bullpen looks better than average. A crappy defense remains the issue with this team, but they had an all-time great strikeout staff last year (23.4 K% as a team, tied with Rays for best in baseball, both tied for highest mark of all time---it is indeed The Era of Strikeouts) so it doesn't matter as much. The division is suddenly crowded with potential contenders but this will be the year the Indians finally unseat the Tigers and come out ahead of the pack. A hard team to figure, they've got plenty of offensive firepower and some top-flight pitchers but the back of the rotation looks shaky and the bullpen could be terrible. This year could be the last hurrah for the current contending core of Tigers---their division rivals are quickly improving, David Price will be gone after this year, Justin Verlander's exhibited signs of fading, and their key hitters are getting toward their decline stage. For this final run at a title they've assembled quite possibly the best lineup of the Dave Dombrowski era, with Miguel Cabrera and Victor Martinez now backed by two sluggers in J.D. Martinez and Yoenis Cespedes, speed atop the lineup from Anthony Gose and Ian Kinsler, and a rare sight for the Tigers in the emerging young hitter Nick Castellanos. They've also got one of the most exciting shortstops in the game, Jose Iglesias, back on the field after a lost year. With plenty of offense and Iglesias picking it at short, they'll be a fun team to watch, but sadly there's little hope for a World Series title in Detroit unless they can finally solve their bullpen conundrum. The Pale Hose went on a shopping spree this winter and practically became a new team. Last year they had two of the top players in all of baseball, newly arrived Cuban slugger Jose Abreu and long lanky mound master Chris Sale, yet still somehow lost 89 games. This year they've built a nice supporting cast around those two and could be in the mix for a Wild Card spot all year. Free agent pickups Adam LaRoche and Melky Cabrera are huge offensive upgrades and they'll be getting back promising outfielder Avisail Garcia. The rotation is now fronted by three formidable pitchers with Sale backed by right hander Jeff Samardzija and the quietly excellent young lefty Jose Quintana. Plus their horrendous bullpen was revamped with the addition of closer David Robertson at the back end. The ingredients for a contending team are here, it's just a matter of them mixing it all together effectively. Here comes the hangover. While their division rivals beefed up, the Royals had a strange offseason in which they picked up two aging and unexciting hitters in Alex Rios and Kendrys Morales while saying goodbye to their best pitcher and team leader James Shields. While the bullpen and defense should be excellent once again, the Royals appear to be light on starting pitching and the offense will again be depending on the likes of disappointing youngsters Eric Hosmer and Mike Moustakas. I'll also be shocked if catcher Salvador Perez doesn't show signs of fatigue after playing far too many games last year in the regular season and playoffs. The experience of playoff success was probably edifying for this young squad and should help them succeed, but there's just not nearly enough production here for them to overtake the Tigers, White Sox, and Indians. After four straight years at the bottom of the standings, the unremarkable Twinkies will spend yet another season in the basement. To be fair, they aren't the Phillies, stuck at the bottom with an old, expensive roster and a crappy farm system. The Twins have some solid young players on their roster right now---27-year-old second baseman Brian Dozier is a budding star with lots of pop, walks, and good defense; Kennys Vargas and Oswaldo Arcia are each under-25 and have displayed immense raw power; 24-year-old Danny Santana was phenomenal in limited action last year; Phil Hughes turned in his best season in 2014 and he's still just 28 despite entering his 9th big league season---and two super highly touted prospects coming through the minors in slugger Miguel Sano and baseball's #1 prospect Byron Buxton. But it's going to take some time before the kids mature into consistent major league contributors and the rest of this bunch does not have the makings of a team that can unseat any of the Royals, Indians, White Sox, or Tigers any time soon. Like the AL East, so many flawed teams here, it's hard to pick one to win. Jack Z. in Seattle appears to have finally pieced together a team worthy of the playoffs. Last year they finished one game out and if you watched them play it was obvious that this pitching rich team was held back by an offense with two stars and little else. Robinson Cano and Kyle Seager played nearly every game and put up big numbers, but they couldn't carry this team to the playoffs on their own. Going into 2015, the two dependable left-handed hitters finally have some support. The big addition is Nelson Cruz, a one-dimensional slugger whose all-or-nothing style may not be a perfect fit for cavernous Safeco Field but is an above-average hitter nonetheless. Perhaps more significantly they added lefty Seth Smith, an on-base machine who fulfills the Mariners' biggest need. Plus they bring back center fielder Austin Jackson who, despite playing terribly in Seattle after arriving in a trade last year, is a good bet for a bounceback at 28 years old. He'll be in the leadoff spot in front of Cano, Seager, Cruz, Smith and the improving Logan Morrison who's still just 27. The young guys who've looked overmatched the last couple years---Mike Zunino, Dustin Ackley, Brad Miller---now get to figure things out batting 7-8-9. Suddenly this lineup doesn't look so bad anymore. The A's never cease to fascinate avid baseball geeks like me. With their most recent contending core showing signs of fading after last summer's swift descent in the standings, fearless roster-shuffler Billy Beane completely dismantled his team and built it back up again in the course of one winter. After trading away one of the game's best players, Josh Donaldson, on the heels of an great season, it seemed like Beane was simply gutting the team to prepare for a gradual rebuilding process. Instead the trades only kept coming and by the time the Hot Stove embers faded the A's looked like they might have a newly redesigned winner. The new roster certainly has its share of holes---an offense short on power and relying on some undependable players like the capricious former Mets first baseman Ike Davis, unproven infielder Marcus Semien, a full staff of young or fragile pitchers, and the disappointing, oft-injured third baseman Brett Lawrie. But, as always with Beane's A's, they've got a ton of intriguing starting pitchers, a bullpen that could be fantastic, a strong defense, and a roster with plenty of depth and flexibility. With continued success through so many different roster iterations over the years, you eventually have to give credit to the organization itself; the front office decision makers, player development figures, and coaching staff. While formidable think tanks have developed in many organizations around the league over the years (due in large part to the influence of Moneyball), the consistently contending A's remain the gold standard. I'll be rooting for them hard this year, but I do think they'll end up finishing just outside the Wild Card race. The success of last year's Angels kinda baffled me. Yes, they have the greatest baseball player in the world, Mike Trout. They've got some solid players around him and GM Jerry DiPoto built a nice bullpen on the fly after a few relievers tanked to start 2014. But that's basically it. The rotation looks like it could crumble any second now, with its top arms Jered Weaver and C.J. Wilson declining rapidly last year and the only saving grace being the out-of-nowhere success of 28-year-old rookie Matt Shoemaker. They will be getting last year's breakout phenom Garrett Richards back sometime soon, but that will give them exactly one top-notch starter and a presumably rusty one no less. There are many flawed, unbalanced teams in the AL and the Angels are certainly one of them. But while the Blue Jays and Red Sox have deep, imposing lineups to counteract their questionable pitching, the Angels have a lineup of Mike Trout, a geriatric Albert Pujols, and a bunch of solid but unspectacular role players. I don't think they'll be bad, but it'll be surprising if they come anywhere near last year's 98 wins---88 wins seems more like it. I had the privilege of watching the Astros in spring training last month. The second batter of the game, George Springer, crushed a triple off the wall before Chris Carter launched a homer into center field. There will be plenty of that this year. The Astros suddenly have an interesting team with tons and tons of power. Springer and Carter (combined 57 bombs last year) will be main sources and they've also now got the bare-handed beastly slugger Evan Gattis, all-or-nothing outfielder Colby Rasmus, and ferociously-swinging first baseman Jon Singleton in the mix. It'll be raining baseballs in the Crawford Boxes this year. Houston developed two excellent starters out of nowhere last year, Dallas Keuchel and Collin McHugh, both of whom are just 27, and the peripheral stats (3.21 and 3.11 FIP respectively) suggest they weren't flukes. The team was intent on improving its atrocious bullpen over the offseason and it appears they've done just that, bringing on two of the game's most reliable and quietly dominant relievers in Luke Gregerson and Pat Neshek. This team will win some games this year, they might even flirt with .500 or, if all breaks right, a Wild Card spot. I'm confident that, at the very least, they'll once again finish ahead of the Rangers. After two straight World Series appearances followed by two straight excruciating late season slides, the Rangers have now fallen into a dead zone. Last year they were hexed, suffering a rash of injuries to nearly everybody and losing 95 games in a lost season. Before the 2015 regular season could even get started the injury bug bit again and now, despite having the great Adrian Beltre in the heart of the lineup, the Texas Rangers once again look poised to spend six months wandering in a desert of confused sadness, wondering where it all went wrong.